From the authors: Some patients with end-stage kidney disease (ESKD) prefer to use catheters to access their blood for hemodialysis or are not candidates for other forms of dialysis vascular access. Catheters are discouraged because previous studies have found them to be associated with higher risks of complications. Because catheter use in Canada is high, we studied how often the use of catheters was associated with poor clinical outcomes. We found that approximately one-third of patients who used catheters for up to 2 years experienced complications including infections, but they infrequently led to death. These results may not be applicable to other countries but this study should help dialysis providers to better inform patients about the risks associated with use of hemodialysis catheters. From the authors: The low adoption rate of quality of life assessments in some countries, including Japan, led us to examine whether the single-item question, “How much time during the past 4 weeks did you have a lot of energy?”, is linked to physical health among hemodialysis patients. We observed that Japanese ESKD patients with an elevated heart rate or who use medications for sleep or depression reported lower energy levels. In contrast, more effective dialysis treatments and better nutritional status were associated with higher energy levels. In addition, lower energy levels were associated with worse survival and higher admission rates due to heart, brain, or vascular disease. A single-item question about energy level provided important information about current and future health status. From the authors: Routine bloodwork for patients on hemodialysis has both financial and opportunity costs, but there are fewer data on how the frequency of measurement affects patient outcomes. 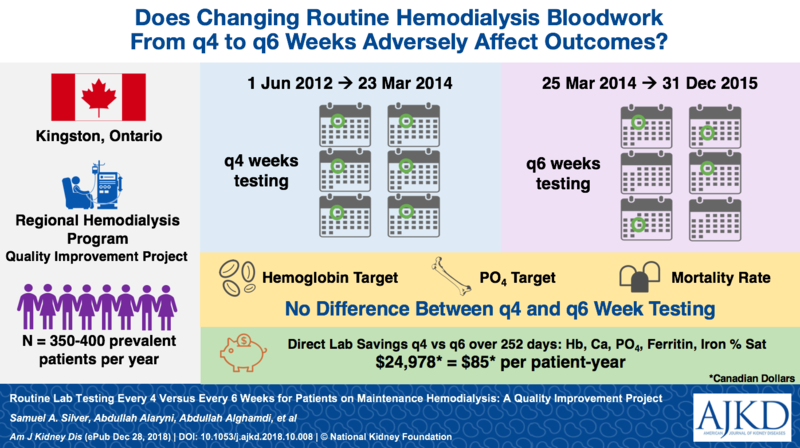 In this quality improvement study, we compared clinical outcomes and laboratory costs after a program-wide change from routine bloodwork at four-week intervals to six-week intervals. We found that the number of patients who achieved recommended hemoglobin and bone disease targets did not change after the switch in routine bloodwork frequency. These effects were sustained for over 18 months and saved our program Can$85 per patient-year in laboratory costs. While our results need to be confirmed across other clinical outcomes and at different hemodialysis centers, these data suggest that it is reasonable for programs to reexamine the frequency of bloodwork because it may represent an opportunity to devote greater efforts towards other healthcare activities that better improve patient outcomes or experiences. From the authors: The mechanisms underlying the decline of kidney function are not fully known. Endogenous ouabain (EO), an adrenocortical cardiac glycoside, and its related genes have been previously associated with acute and chronic kidney damage. This study explored the relationship between genetic variants of Lanosterol Synthase (LSS), an enzyme important in determining EO levels in the kidneys, and both acute kidney injury (AKI) following surgery and loss of kidney function in the setting of hypertension. LSS variants were investigated in: 1) patients undergoing cardiovascular surgery; 2) human kidney; and 3) patients newly diagnosed with essential hypertension. We found that incidence of AKI and the rate of decline of kidney function in patients with hypertension was greater with a particular LSS variant. This same variant was associated with increased EO content in kidney tissue. Detection of this LSS genetic variant may be used for identification of high-risk patients for kidney disease and, potentially, represents a new therapeutic target to prevent or slow the development of kidney disease. From the authors: Periodontitis, commonly referred to as gum disease, is associated with increased systemic inflammation and might contribute to loss of kidney function. However, evidence for such a potential association is sparse and only a few longitudinal studies have been previously reported on this association. Using data from the Study of Health in Pomerania, we studied the association of periodontitis with decreased kidney function using data from a cohort examined over 11 years. We performed a statistical analysis first in the subset of study participants whose data from their follow-up visits were complete, examining the influence of various measures of periodontitis on kidney function. We then extended this analysis to include participants for whom data were partially missing and imputed. In contrast to the majority of previous studies, we did not find consistent associations between periodontitis and decreased kidney function. This study’s findings are not consistent with the hypothesis that periodontitis is an important risk factor for chronic kidney disease. From the authors: Muscle relaxants are used to treat musculoskeletal pain and cramping, which are commonly experienced by hemodialysis patients. Patients on hemodialysis may be especially vulnerable to adverse events from the use of these agents due to existing risk factors and the accumulation of metabolites in the setting of renal impairment. However, epidemiologic data characterizing the prevalence and risks of muscle relaxant use in this population are lacking. Among U.S. hemodialysis patients, muscle relaxant use was common and associated with altered mental status and fall. The observed lower risk of death with muscle relaxants may have been the result of residual confounding. Future research to define the appropriate use of muscle relaxants in this population is warranted. 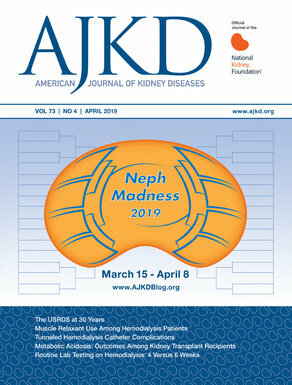 On the Cover: AJKD is proud to present the 7th annual NephMadness, which began on March 15, 2019. This educational initiative, modeled after the US college basketball tournament, was launched in 2013 to increase awareness of World Kidney Day and to encourage conversation about kidneys and kidney diseases on social media. NephMadness 2019 featured 32 nephrology topics grouped thematically into 8 “regions”: complement, exercise, hepatorenal syndrome, hospitalist nephrology, hypertension, pain management, plasmapheresis, and volume assessment. From March 15-31, individuals or groups submitted their brackets to predict which teams moved on to the next round. The results from each round, determined by a 9-member panel of nephrology experts, was announced throughout the week of April 1-8. US-based physicians are able to claim up to 8.0 CME credits and MOC points until June 15, 2019. Information on NephMadness is available here. The NephMadness 2019 logo is created by Peter Dong, ©AJKD. On July 14, 2016, representatives from the patient community, academia, industry, and government, including the US Food and Drug Administration (FDA), Health Canada, and the European Medicines Agency (EMA), convened to discuss the need for new clinical end points in ADPKD, particularly surrogate end points for use in earlier stages of disease. The conference was organized by the PKD Outcomes Consortium (PKDOC) under the auspices of the PKD Foundation and Critical Path Institute (C-Path), an independent nonprofit organization established in 2005 as a public and private partnership to catalyze the development of new approaches that advance medical innovation and regulatory science. This report provides an overview of the regulatory requirements for drug approval in the United States as they relate to the development of therapies to treat ADPKD and summarizes progress made to date during the summit and follow-up meetings.